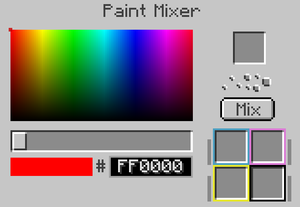 The Paint Mixer is a device added by the OpenBlocks mod. The purpose of the Paint Mixer is to create cans of paint to use with a Paint Brush, from dyes. The GUI of the device has several components. On the left is the color selection area, where a color is selected simply by clicking it in the color chooser rectangle or by entering it into the color code box, which takes hexadecimal values. The slider in between them changes the saturation of the color. On the right, the player has to input either an existing Paint Can, which will be refilled with the new paint color, or to create a new Paint Can from scratch, a bucket of milk. It's important to note that placing a bucket of milk or a Paint Can into the slot will reset the color of the picker to the color of that item. At the bottom below it, 4 dyes have to be placed to create the color, like modern color printers, it takes cyan, yellow, magenta and black. The are represented by the dyes: Cyan Dye, Magenta Dye, Dandelion Yellow and Ink Sacs. To create the paint, the user finally clicks the Mix button. After a short delay, a new bucket of paint with the requested color will appear in the input slot, given that enough dye resources were available to create the color. This page was last modified on 4 May 2018, at 13:41.